Half-length portrait of Richard Henderson sitting in a laboratory, taken at the MRC Laboratory of Molecular Biology in Cambridge, October 2017. 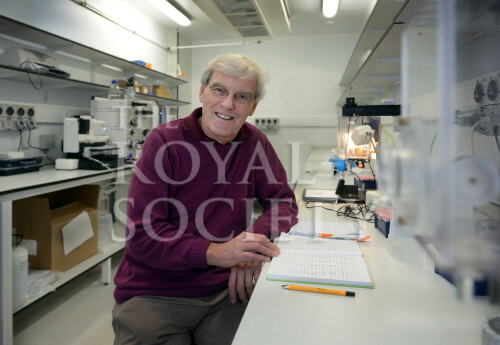 Richard Henderson is a British molecular biologist, he was elected a Fellow of the Royal Society in 1983. He was jointly awarded the 2017 Nobel Prize for Chemistry for ‘developing cryoelectron microscopy for the high-resolution structure determination of biomolecules in solution’. He was awarded the Copley Medal in 2016 for his work on imaging techniques which have enabled scientist to understand the arrangements of atoms in important biomolecules.